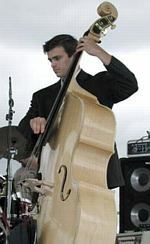 Saratoga based bassist Mike DelPrete earned a bachelors degree from Skidmore College where he studied bass with Rich Syracuse and was a member of a Downbeat Award winning student ensemble. DelPrete recently earned a MFA degree in composition from Bennington College where he studied with Allen Shawn, Nick Brooke and Milford Graves. DelPrete is currently a faculty member at the National Guitar Workshop and an adjunct faculty member at Bennington College. He maintains an active performance schedule with a variety of musicians throughout the Northeast.